This page is only a representation of sampled clutches, it is not to be used as a gauge to whether or not your tortoise is under or over weight. There are vast differences in weights and sizes even when maintained in identical environments, some grow faster some grow bigger and so on, none of us grow at the same rate, some will be half or twice the size of their brother or sister within months. The sole purpose of this data is to give a small snapshot of noted growth over a period of time. The 2 lines shown on the graph above represent the high and the low average of sampled data taken over a 4 year period, as you can see even on identically kept hatchlings the average growth rates are varied, in different conditions this margin could be far greater. Testudo graeca ibera - Initial growth tends to be slower than T.h.b, perhaps generally being a little more timid species. Testudo horsfieldii - Growth rates not too dissimilar to that of T.h.b from birth. We have found some specimens to be ravenous feeders, this could be in part due to their natural environment restricting them to only a fairly small window of opportunity for foraging. In captivity the Horsefield's tortoise can grow at a unnaturally high rate, so great care can be required to avoid obesity. Testudo marginata - Similar growth rates to T.h.b from birth, but accelerating at a faster rate as the months go on to obtain their larger adult size. To some people the data compared to that of their own tortoises growth may think they have an over weight tortoise, not necessarily so, this is just the conditions in which we maintain our tortoises we try our hardest to not feed them excessively rich foods, as far as reasonably possible attempting to match what would be their natural growth, although they are still above this. Over the years we have witnessed / taken in tortoises which have been over weight and with resulting deformities, along with the external deformities there are usually internal ones to match, it has been suggested by many that obesity can be a contributing factor to a shortened life, and dramatically reduce chances of fertility. At three years old a Herman's kept by ourselves would weigh in at around 150g - 300g ( there's a big difference there see! ) but we have on occasion witnessed pets of the same age weighing in at ~1,200g! - the weight of a mature female! This is usually the result of incorrect diet management (inappropriate care \ lack of knowledge) the aim is to grow the tortoises up as fast as possible without any thought for their health. Although this female is nearing full weight this doesn't mean she will produce fertile clutches of eggs in fact if she isn't formed to accommodate the eggs she could become seriously egg bound, and now at 9 years old the female still has yet to produce fertile eggs. She also retained an infertile egg and after a confirmation X-ray to assess her calcium levels and the retained egg, Bruce Maclean (a recommended UK reptile vet, [here] ) administered a calcium injection followed by an injection of Oxytocin. The egg was passed with out complication 6 hours later. On the other side of the coin a 6 year old female at half the weight (600g) mates and to the shock of the keeper produces fertile eggs, obviously this isn't a good idea to breed them at such a young age or attempt to feed them up to adulthood fast, either way can jeopardise their health. 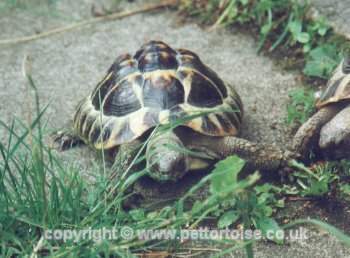 The photograph shows the possible result of an incorrect diet and environment, the pyramiding of the carapace, excessively long beak and claws on this male tortoise are only the external results. At 3 years old he was pretty much 3 times larger than what we would expect to see at this age. Often record keeping is an over looked routine and thought of initially as a chore, It doesn't have to be so, just a few minutes on a regular basis is a well worth while exercise, for not only will it help you monitor your tortoise(s) well being but it can also contribute to captive maintenance information for tortoise enthusiasts worldwide. To show our commitment we have made things even easier by reworking our own record keeping package the Tortoise Diary for all to use, You'll also be pleased to know its Free! so now there's no excuse not to do your bit ... !